Home » EV Technology » 600 kms Range from a 115 kWh Battery pack, Not a Problem! 600 kms Range from a 115 kWh Battery pack, Not a Problem! The New York Times are running a post today about the Kolibri-powered Audi A2, converted by DBM Energy GmbH and Lekker Energie that traveled 375 miles from Munich to Berlin on a single charge back in October 2010. There seems to be some controversy because the A2 was destroyed in a fire last December while parked in a warehouse. DBM claims that a makeshift battery unit, and not the one used during the supposed record run, was installed at the time. The fire is under police investigation, but it has prompted skeptics to question whether DBM has anything to hide. The ignorance surrounding this story is staggering. To those who know a little about the technical aspects of EVs, there seems to be nothing remarkable about a small Audi A2 travelling 375 miles (600 kms) using a battery pack with a capacity of 115 kWh. That is more than twice the capacity of the 53 kWh battery pack in a Tesla Roadster which is rated by the EPA at 255 Miles range in normal road use. In fact, a Tesla owner from Texas recently achieved a new distance record of 347.2 miles (555.5 kms) from a bog standard Roadster on a closed course in California. 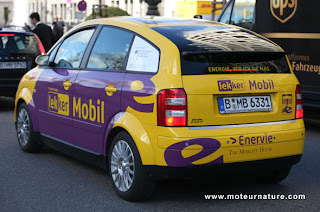 It was reported that upon the A2's arrival in Berlin it's 115-kWh battery pack was 80% depleted. Total energy used during it's 375 mile trip being 92 kWh. Dividing 92,000 watt hours by 375 miles gives an energy consumption of 245 watt hours per mile. That is right on the money as far as average electric vehicle energy consumption goes. A Chevy Volt or a RAV4 EV use approx the same amount of energy per mile, so no surprises there;. Anyone who writes about EVs should be capable of doing this basic EV maths! The NYT writer goes on to suggest as only 80% capacity was used that this would implying a total range of more than 400 miles. It's fairly common knowledge that Li-ion battery powered EVs do not use 100% of their battery capacity. The Chevy volt uses just 50%, The Tesla Roadster 70%, Nissan Leaf 80% etc. The current world record for distance on a single charge goes to the Japan Electric Vehicle Club who ran a Daihatsu Mira EV over 627 Miles (1,003.184 kms) on a single charge. The fact the Mira was equipped with a 74 kWh battery pack actually backs up the claim that the DBM Audi A2 was well within it's ultimate potential for maximum distance. The 'facts' used in the NYT story seem to have been mostly provided by a Peter Hoffmann who publishes a Pro Hydrogen Fuel Cell web site with possible links to a certain large German automaker currently pushing Hydrogen FC cars. The impartiality of information from such a biased source would have to be questioned.